F-8 Digital Fly-By-Wire (left) and F-8 Supercritical Wing in flight. These two aircraft fundamentally changed the nature of aircraft design. The F-8 DFBW pioneered digital flight controls and led to such computer-controlled aircraft as the F-117A, X-29, and X-31. Airliners such as the Boeing 777 and Airbus A320 also use digital fly-by-wire systems. The F-8 Digital Fly-By-Wire (DFBW) flight research project validated the principal concepts of all-electric flight control systems now used on nearly all modern high-performance aircraft and on military and civilian transports. The first flight of the 13-year project was on May 25, 1972, with research pilot Gary E. Krier at the controls of a modified F-8C Crusader that served as the testbed for the fly-by-wire technologies. The project was a joint effort between the NASA Flight Research Center, Edwards, California, (now the Dryden Flight Research Center) and Langley Research Center. It included a total of 211 flights. The last flight was December 16, 1985, with Dryden research pilot Ed Schneider at the controls. The F-8 DFBW system was the forerunner of current fly-by-wire systems used in the space shuttles and on today's military and civil aircraft to make them safer, more maneuverable, and more efficient. Electronic fly-by-wire systems replaced older hydraulic control systems, freeing designers to design aircraft with reduced in-flight stability. Fly-by-wire systems are safer because of their redundancies. They are more maneuverable because computers can command more frequent adjustments than a human pilot can. For airliners, computerized control ensures a smoother ride than a human pilot alone can provide. Digital-fly-by-wire is more efficient because it is lighter and takes up less space than the hydraulic systems it replaced. This either reduces the fuel required to fly or increases the number of passengers or pounds of cargo the aircraft can carry. Digital fly-by-wire is currently used in a variety of aircraft ranging from F/A-18 fighters to the Boeing 777. The DFBW research program is considered one of the most significant and most successful NASA aeronautical programs since the inception of the agency. F-8 aircraft were built originally for the U.S. Navy by LTV Aerospace of Dallas, Texas. The aircraft had a wingspan of 35 feet, 2 inches; was 54 feet, 6 inches long; and was powered by a Pratt & Whitney J57 turbojet engine. The F-8 Supercritical Wing was a flight research project designed to test a new wing concept designed by Dr. Richard Whitcomb, chief of the Transonic Aerodynamics Branch, Langley Research Center, Hampton, Virginia. Compared to a conventional wing, the supercritical wing (SCW) is flatter on the top and rounder on the bottom with a downward curve at the trailing edge. The Supercritical Wing was designed to delay the formation of and reduce the shock wave over the wing just below and above the speed of sound (transonic region of flight). Delaying the shock wave at these speeds results in less drag. Original wingspan of the F-8 is 35 feet, 2 inches while the wingspan with the supercritical wing was 43 feet, 1 inch. F-8 aircraft were powered by Pratt & Whitney J57 turbojet engines. The TF-8A Crusader was made available to the NASA Flight Research Center by the U.S. Navy. F-8 jet aircraft were built, originally, by LTV Aerospace, Dallas, Texas. Rockwell International's North American Aircraft Division received a $1.8 million contract to fabricate the supercritical wing, which was delivered to NASA in December 1969. 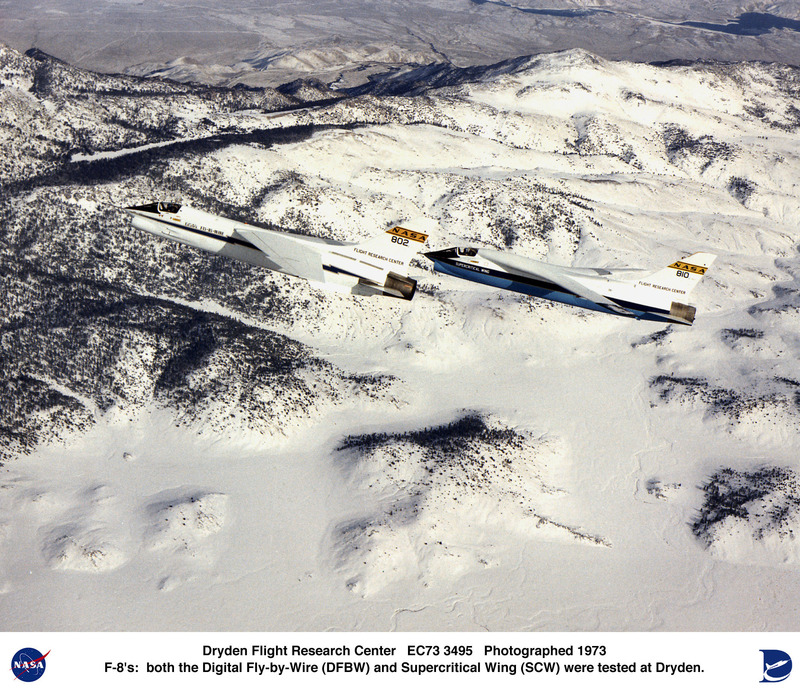 Keywords: F-8A Crusader; Supercritical Wing; Dryden Flight Research Center; LTV Aerospace; Rockwell International; Pratt & Whitney; J57 engine; turbojet; transonic; Dr. Richard Whitcomb; John McTigue; Tom McMurtry; Ron Gerdes; F-8C Crusader; Digital Fly-By-Wire; LTV Aerospace; Dryden Flight Research Center; Langley Research Center; Pratt & Whitney; Gary Krier; Ed Schneider; Boeing 777; F/A-18; J57; turbojet.